The following hotels and motels are within short driving distances of each of our chapel locations. We hope this list is useful when securing accommodations for families that are in town to attend funeral services. Stevenson & Sons has made special arrangements with two fine Miles City motels (listed below). 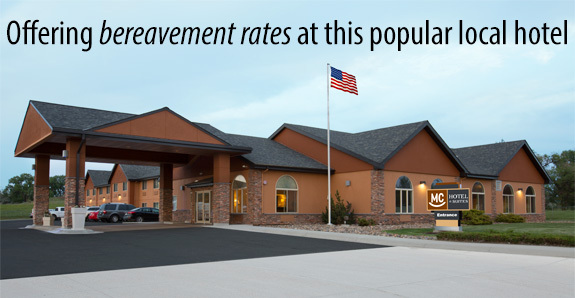 Both of these convenient motels offer Bereavement Discounts. When contacting either motel, please be sure to mention that you (or your out-of-town guests) will be visiting Miles City to attend a Stevenson & Sons funeral. This will ensure that you receive the special Stevenson & Sons Bereavement Discounts when booking rooms.